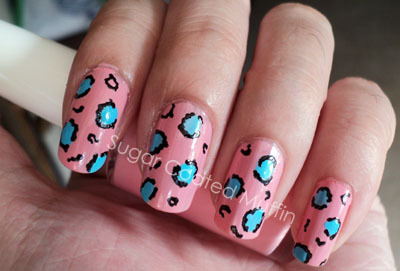 After my first leopard nail attempt, I realized that I LOVED having leopard prints on my nails. So simple and easy to do ^_^ Total no brainer too lol Don't have to crack my brains to think of a design since I'm not creative. Done using 06 Pink from Elianto (one of my favs), baby blue & black nail art pen from night market. Before applying the black, I was a little worried cos it looked kinda weird. Refer to pic below lol! Talking about leopard prints.. 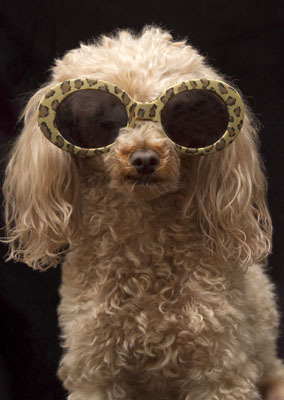 I'm looking for a pair of leopard print shades =/ Spotted a nice one at the night market but wasn't sure if I would actually wear it plus the lenses were normal tinted ones (no UV protection). Will experiment with other colours next time xD I find that after abandoning my nails for quite a while, it's harder to use my left hand =_= So shaky and I didn't have the strength to squeeze the nail art pen. Pfft.. I can't do my left hand even when I haven't skipped out on my nails for a while. My aunt is ambidextrous. I like what you've done with your nails here, though. Makes me want to pick up a nail art pen and try for myself. Ouch.. That happened to me when I was trying to remove those big chunky glitters from my nails.